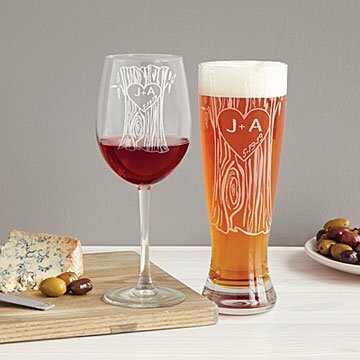 Celebrate a couple's love of wine, beer, or both with these hand-engraved sweetheart glasses. Toast all the little things you love about each other that make your romance unique with Jennifer Fillinger's beautiful hand-engraved glasses. Jennifer is the third generation in her family to carry on the lost art of stone wheel engraving, and her arboreal tribute to romance features an intricate faux bois pattern based on her original illustration. To give each glass a personal touch, she diamond engraves the lovebird's initials and the date of their anniversary in the "bark." Available as a set of two wine or pilsner glasses or one of each. Handmade in Johnson City, Tennessee. See our Etched Tree Trunk Champagne Flutes, perfect for wedding or anniversary toasts. The third generation in her family to practice glass engraving, Jennifer Francis Fillinger strives to create glassware that is versatile, reusable, and memorable. As a child, her mother taught her the intricate techniques she uses to create her pieces, including the lost art of stone wheel glass cutting, rotary diamond bit hand-engraving, and sandblasting. Her favorite part of the process is personalizing each of her designs because it marks a special time, place, or event that brings joy and will be cherished for years to come. Hand wash Do not microwave or add hot liquids. Glassware is not heat resistant and may break with extreme temperatures. A unique gift, and perfect for recognizing our 50th Anniversary. Definitely liked the option to get both as beer glasses, rather than one wine and one beer as displayed. Many compliments on the idea. Never personally bought this set for me and my wife but every other couple that I have bought it for is always extremely satisfied when they receive it. Usually my cousins and I just exchange gift cards. This year for Christmas I wanted to do something special to commemorate my cousin getting married in June. She likes to drink wine and her fiance likes beer, so this set was a good match! I had previously picked up a generic set in the store but I loved that this set was personalized to them. It was a huge hit! Every order has been perfect and professionally handled. Cannot recommend more! This was a gift to my daughter and her husband on their wedding day. Great way to toast the occasion in personalized pilsner with wedding date inscribed. I always like to get a personalized item for wedding gifts, and Uncommon Goods delivers every time. We were with our friends the night they met at a beer garden, so the personalized pilsner glasses were the perfect callback to that moment. They were very touched and overwhelmed by the thoughtfulness. I even carried the glasses around in the warehouse packaging they sent it in as we traveled for the wedding, and it kept the items safe throughout our journeys. Definitely recommend! Wonderful unique gift for someone who has everything!! These glasses will be used at my daughter's wedding to a brewer. What could be more perfect? I was looking for a unique gift for friends celebrating 40 years of marriage and turned to Uncommon Goods. Found it!!! Adorable Pilsner glasses hand engraved with heart-on-tree design with their initials and date of wedding!!! Perfect! Uncommon Goods comes through again!!! Engraving is well done!